This is a report that is rich with miracles, abundance and blessings all around. As I dream a bit in my office as rain softly raps against my darkened window, I relive the victories RRR has had ushering kids, who have found healing in the embrace of a horse, into their new lives as successful students at college. They were once kids who refused to even go to high school, but are now on their way to a career and a life that will be full of healthy relationships. We have increased our ranks by 5 new “clients” and their families, so our numbers have grown, which is the thing that drives me to keep my “hand steady on the plow” so that more and more kids and families can be served. Our fundraising, including grants and individual giving, as well as our annual event, has blown away my wildest imagination. I am so grateful for this abundance, but know that there is so much more left to do. One of my newest girls came to RRR after spending a summer on the edge of suicide. She was one of the lucky ones to have a spot open up just in time to help turn her suicidal ideation around. She chose our beautiful, fatherly Thoroughbred, Sport, as her own. When he met her, it was love at first sight. Her need for direction and protection must have surrounded her so clearly to our stately, giving horse. He is very tall, but became so submissive and gentle that this slender young lady never had one moment of fear at his power and size. He followed her around the arena like an obedient, loyal Labrador puppy who wants only to be with his person. Each week when she came, she spent long, quiet moments grooming each part of his beautiful chestnut coat with a tenderness that I could feel even while standing several feet away. I did not intrude. This was their time to bond and feel each other on a level that defies explanation. Recently, when she arrived, she was quite upset to learn that Sport had experienced an inexplicable seizure a few days before. I explained to her that I had contacted the vet, who had no answers for me and told me just to keep an eye on him. Sport’s girl suggested, out of true love for the kind animal, that she “take it easy” with him that day, and that she wanted to just spend time with him. I suggested that she could sit on a stool near him and draw whatever came into her mind. He stood over her, in the way horses stand guard over herd members that are sleeping on the ground or foals that are napping. He even checked out her artwork several times. As I watched him guarding her, and her, caring for him, I found a deeper understanding of just how this horse-relationship form of healing truly works. As you are thinking of all of the possible worthy causes you could support with your charitable donation, please give Raven Rock a thought. Your contributions directly support the horses and the Facilitators who love and care for our kids. 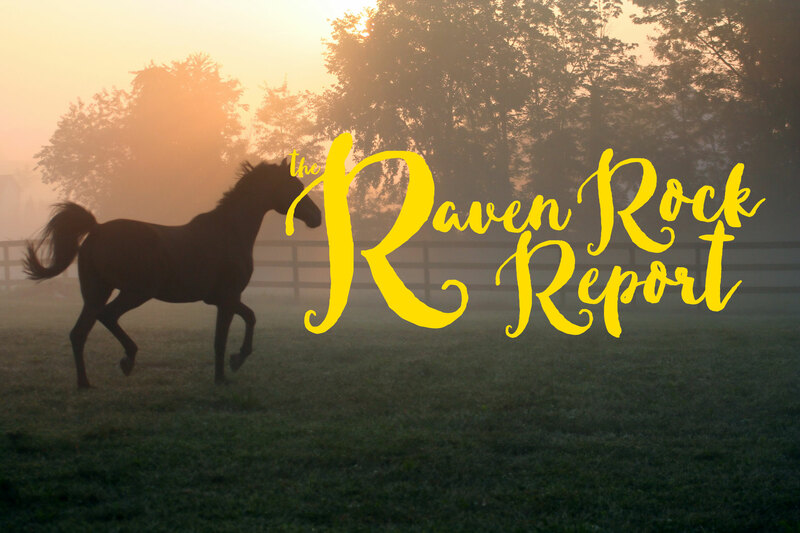 I can promise you that when you donate to Raven Rock Ranch, your heart will fill up with that sunshine that washed over the two friends inside and out that cold winter’s day when I had the privilege of observing them. As always, my deepest gratitude to all of you who have become an important part of our Raven Rock Family.